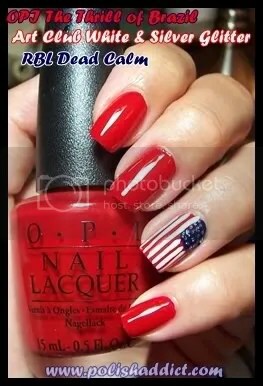 This is my attempt at a patriotic mani for the 4th of July. 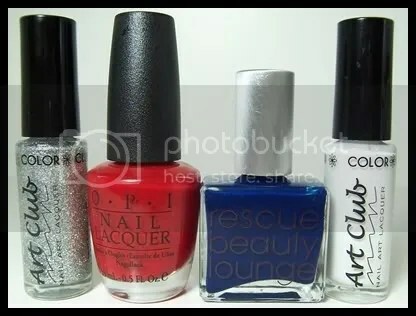 I used the following: OPI The Thrill of Brazil (and believe me, the irony is not lost on me), Rescue Beauty Lounge Dead Calm, Art Club by Color Club White and Silver Glitter, both of which are available individually or in the Art Club Bridal Kit. I was torn over whether to use Silver Glitter or the tiny little silver crystals that come in the Bridal Kit. I ultimately decided to just wing it with the glitter. I’m a major newb at nail art so I have to say – for a first attempt, I’m really pleased with the results. First let me say, I am so sorry about the sub-par application and lighting, again. I’ll be back to my usual application and lighting soon, I promise I’ll get it together. Second, OPI The Thrill of Brazil is one of my favorite reds, EVER. It applies like butter. Opaque in one coat, perfect in two – this red shines like there is no tomorrow. Simply, gorgeous. For the blue, I used Rescue Beauty Lounge Dead Calm. It was great for this mani because it, too, is opaque in one coat. I was able to use just one brush stroke for the blue behind the stars. Click here for a swatch of Rescue Beauty Lounge Dead Calm. Finally, Art Club by Color Club – amazing. I’ve had the Bridal Kit and the Carnaval Kit for a while now but I’ve been stuck in professional-mani purgatory since the beginning of the summer so I haven’t been able to try them out until today. And WOW, I love these nail art polishes. The super long ultra fine brush is incredibly easy to use. The kits in general are pretty great. They come with 4 or so nail art polishes in assorted colors or glitters, decals, beads, stones, and other cute little accents. To celebrate my nail freedom in exactly one month, I’m planning on breaking out all my accumulated nail art products. Seriously, I’ve been stock piling nail art supplies for a few months now in anticipation of a ridiculously elaborate nail art week on The Polish Addict, so if you’re secretly into the kitsch, like me, stay tuned.